An air tanker drops fire retardant June 1, the first day of the 416 Fire. After an environmental review, the Forest Service changed protocols about where slurry can be dropped and also changed the fire retardant’s chemical composition to make it less harmful to the environment. 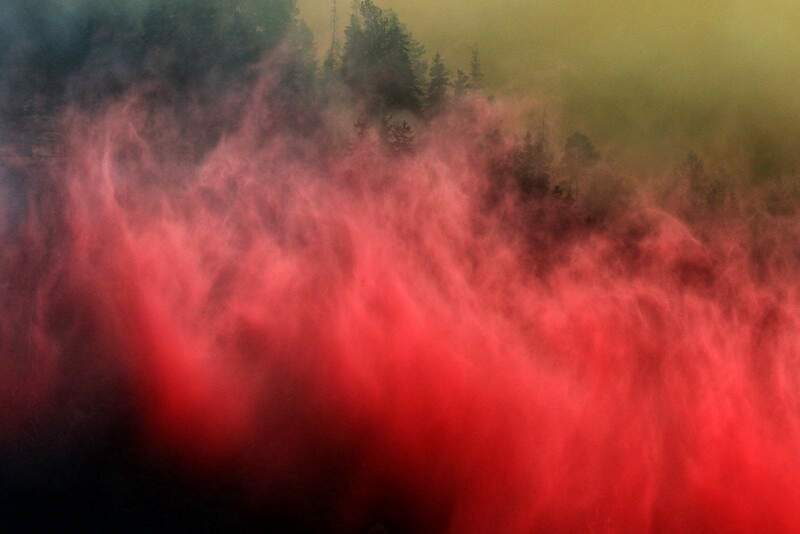 When wildfires threaten homes and property, the sight of an air tanker dropping bright red fire retardant, commonly referred to as slurry, can be a welcome relief. The chemical concoction has come a long way in reconciling the need to fight wildfires while not adversely affecting animals and aquatic life. Fire retardant has been used in some form to fight wildland fires since the 1950s. During a wildfire, firefighters drop slurry on specific areas to slow the fire’s advance, usually to allow crews to get into an area to build hand lines or fire breaks. Fire retardant doesn’t douse flames. Instead, the chemicals cool and coat fuels on the forest floor, depriving them of oxygen and slowing combustion. But over the years, environmental concerns about slurry gained traction as people became more aware chemicals in the mix may affect wildlife, especially fish and other aquatic life. In the 2000s, the Forest Service Employees for Environmental Ethics filed two lawsuits about the use of fire retardant, challenging the federal government’s position that slurry had no environmental effects. Fire retardant falls to the ground June 1, the first day of the 416 Fire. Slurry doesn’t douse flames. The retardant cools and coats fuels on the forest floor, depriving them of oxygen and slowing combustion. Andy Stahl, executive director of the group, said the issue came to the forefront after a major fish kill near Sisters, Oregon. Slurry was dumped across a stream near a fish hatchery, killing thousands of trout for miles downstream. In July 2010, a United States District Court found the U.S. Forest Service’s 2007 environmental review for fire retardant to be in violation of the National Environmental Protection Act. “Never before have so many species been jeopardized by a federal government action at such a wide range as it was with fire retardant,” Stahl said. As a result, the U.S. Forest Service was ordered to conduct a complete environmental review of the use of slurry on national forests no later than December 2011, with consultation from the U.S. Fish and Wildlife Service and the National Marine Fisheries Service. “Several hundred pages of biological opinion found retardant jeopardized numerous endangered species and required mitigation measures be put in place,” Stahl said. The new environmental review prompted the Forest Service to put better protocols in place before dropping slurry in certain areas. Fire retardant covers a portion of the ground June 4 north of Durango. To protect native cutthroat trout populations, firefighters have avoided dropping slurry in Hermosa Creek, Clear Creek, East Fork and Big Bend. For instance, the only time fire retardant may be dropped into waterways is when human life or public safety is threatened. Otherwise, slurry can’t be dropped within 300 feet on either side of a waterway. Also, the Forest Service created an “avoidance map” that shows areas across the country where slurry may not be dropped. If a drop does occur in an off-limits area, firefighters are required to report it. Jennifer Jones, a spokeswoman for the Forest Service, also said that chemicals used in fire retardant have come a long way. In 2011, the Forest Service discontinued the use of a fire retardant that had high levels of ammonia, which caused environmental concerns. The slurry used today has about 30 to 50 percent less ammonia. The current fire retardant falls within the Environmental Protection Agency’s “practically non-toxic category,” and while the agency’s terminology may not sound convincing, the retardant is not considered dangerous to humans. “As with any chemical substance, a small percentage of the population may have an allergy or unusual sensitivity that will not be detected during the evaluation process,” Jones said. 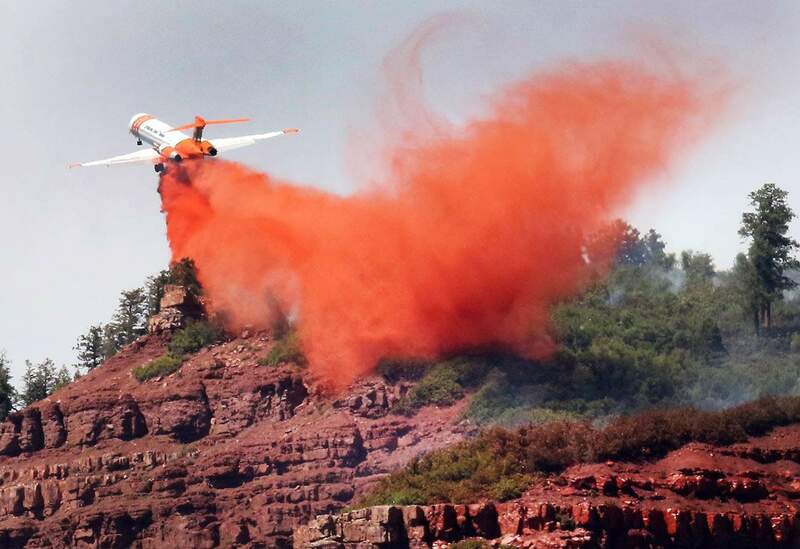 A plane drops retardant on the top of the Hermosa Cliffs on June 7 while fighting the 416 Fire. Gretchen Fitzgerald, a spokeswoman for the San Juan National Forest, said air tankers have dropped slurry to help firefighters protect homes in the Hermosa area. As of Thursday, firefighters had used 189,836 gallons of fire retardant in 62 drops, to the cost of $768,320. Fitzgerald said streams with native cutthroat trout – such as Hermosa Creek, Clear Creek, East Fork and Big Bend – have been avoided to protect fish populations. Stahl, the Forest Service Employees for Environmental Ethics director, still takes issue with the supposed effectiveness of fire retardant, but even so, he said the group is generally pleased with the outcome as it pertains to protecting wildlife. “We’ve been OK with the outcome, more or less, on the environmental front,” he said.